What was your background before coming to CRHP? My Father passed away when I was 1, and my Mother passed away when I was 4, so my Grandmother raised me. I went to school until 7th grade, worked, married, and had 3 daughters and 2 sons. Before coming to CRHP, I managed a small tea stand at the weekly market. In 1970, when I was 32, I was recruited to work at CRHP. I’ve been working here ever since. What were your first responsibilities at CRHP? I was the supervisor of the laborers, which required me to buy the materials for the construction and supervise all of the building projects around campus. I am still a supervisor now after 44 years, but I have also done other jobs. During the food for work program in 1972, I was in charge of distributing the oil and grain for 4 years. I was a driver for 14 years, and during that time I drove a tractor and brought the patients from the bus stand to the hospital. 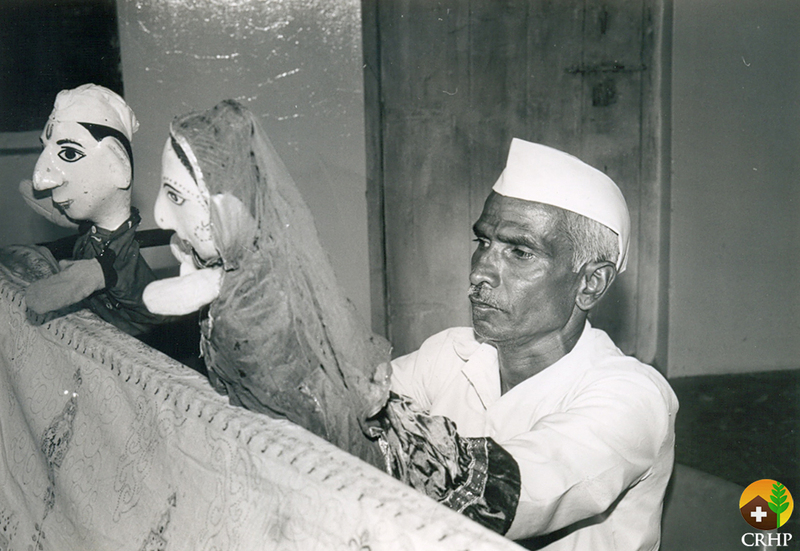 I worked with a puppetry group that would go to the villages with drama and songs. I was also in charge of the mess for some time. What is your favorite part about working at CRHP? Mostly, I like the puppet shows that I used to do for any CRHP function. I know each and every corner of the world because of the puppet shows. I also like to supervise the laborers because they should work honestly. What did you learn from Raj and Mabelle? The first important thing I learned is self-confidence; if you are going to deal with important issues, you have to take a risk and not worry if people will be upset or offended initially. I needed that courage and self-confidence to go on the stage. Secondly, you should not get disappointed with yourself due to a failure, instead you should learn from it. How did you become interested in puppet making and drama? In the 1980’s there was a puppeteer who would come to CRHP to do performances. On one of his trips, he left 6 puppets in Raj’s house, so I asked if I could use them. With his permission, I took the puppets and went home to build a structure with a curtain and a mirror in front to practice. My first audience was Drs. Raj and Mabelle; they liked it so much that they suggested I perform at the Naag Panchami festival in town, which was very well accepted. After this, I began delivering messages about health and social issues through songs and dramas using the puppets. I am very thankful for Drs. Raj and Mabelle’s support and encouragement. Slowly I started writing down the scripts for puppet shows and preformed more and more. I have done shows in 175 villages in this area in addition to different places in Maharashtra as well as West Bengal, Tamil Nadu, Rajasthan, and Uttar Pradesh. I went to Hyderabad with 10 women from the community to learn to make my own puppets from local materials. Since then, I have trained thousands of people at CRHP. When visitors come, it is my duty to train people how to make puppets. 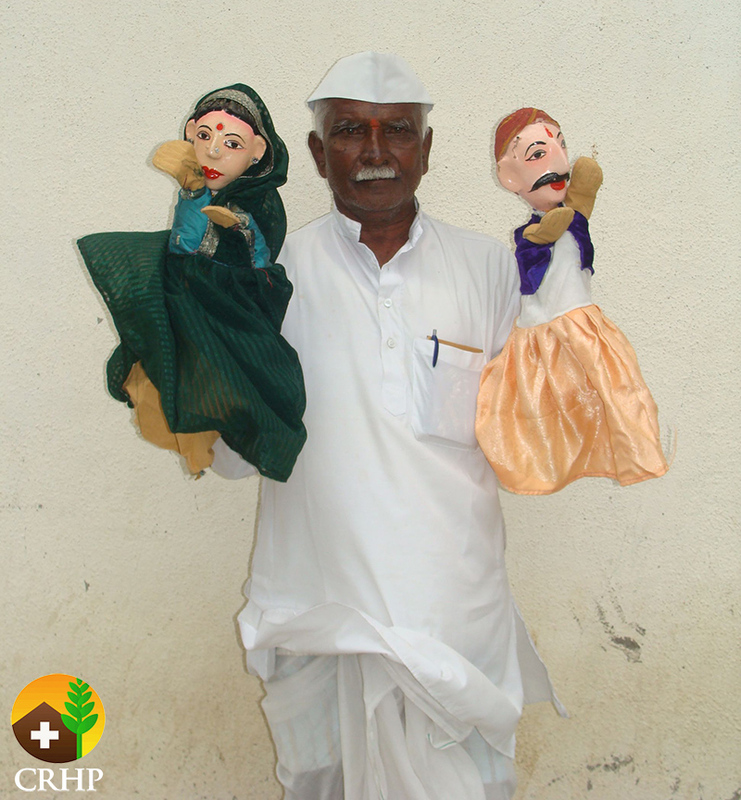 How are puppet shows and drama helpful to address health and social issues in the community? Through drama, I can show what is happening in the community, for example female feticide and domestic violence, things that people may not be comfortable talking about. I can perform about superstitions and tell people that they aren’t good. 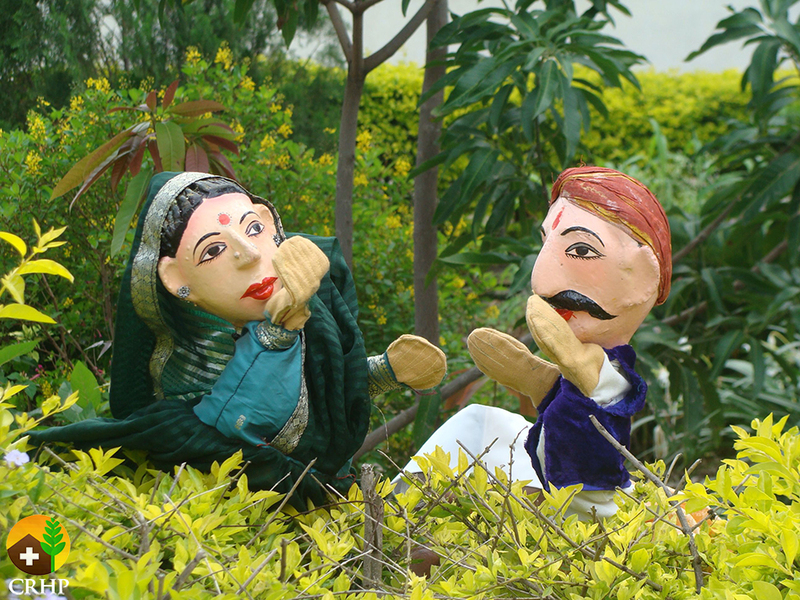 Drama and puppet shows help people understand that the issues are there that they may not see. When we gather people to simply share information, for example family planning messages, no one will listen because that is done everywhere. When I start doing puppets and dancing, the crowd gathers and is engaged so that I can start talking about family planning and they will listen. Thoughts of Drs. Raj and Mabelle inspire me as well as my work at CRHP. What changes have you seen in the community? In the 1970s’, I remember pneumonia, diarrhea, and other communicable diseases were the major causes of death as well as high maternal mortality. Additionally, problems including the dowry system, caste system, poverty, malnutrition, and the low status of women were common throughout the community. CRHP built wells in the lower caste communities, which significantly reduced the caste system. The hand pumps helped everyone learn that we are one and need to come together. Now I see that the caste system, poverty, and communicable diseases have lessened, and I also see more empowerment, confidence, and girls in school. How have you changed since joining CRHP? After joining CRHP, I have changed a lot, and I am happy with these changes. I know how to behave in the community and get along with all people, which is why I now have a lot of respect in my village. I traveled a lot, but I didn’t understand English when I first joined, and now I understand English well. My self-confidence has greatly improved because of CRHP because of what I’ve learned at CRHP and from Drs. Mabelle and Raj. What are your future plans at CRHP? In the future, I want to focus on teaching and learning with more confidence and dedication. I want to share what I know with the community and learn from them also. CRHP is very grateful for Ganpatrao’s never ending dedication and compassion.